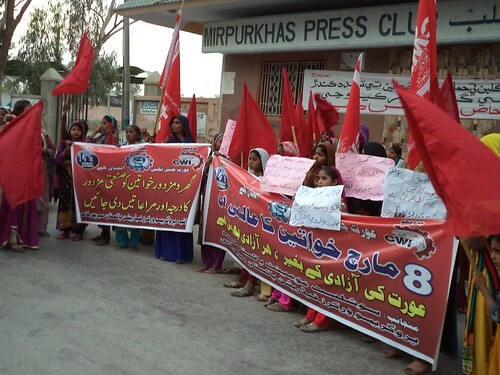 On International Women’s Day 2016 Socialist Movement Pakistan S.M.P held a women’s rally at the office of SMP, Rahim Nagar Mirpurkhas, Sindh. This was followed by a demonstration through Lunda Bazar, civil Hospital Road, to Post Office chowk, Baldiadia Chowk and Hyderabad Road to finish at the Press Club Mirpurkhas. At the Press Club there were several speakers including Iqbal Begum Narejo, Sughran Khaskhely, Sundar Hameed, Rabia Qumbrani, Semntha, & Lareb. They demand that house women worker’s would be registered as industrial workers and given all facilities of industrial workers. The demo was led by Iqbal Begum Narejo, Sughran Khaskhely, Sundar Hameed, Semntha,lela langhani,Jamila, Rabia Qumrani, Shahnaz, Zubida Marri & Nazir Qumbrani.